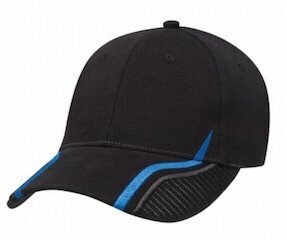 With a distinctive stripe running up the peak and on to the cap, the custom printed Downforce Cap fits any budget. Are you planning your next company event that will bolster team spirit, while at the same time enhance competitiveness of your staff? If you are, then a great promotional product will surely take your event a level higher. Introducing the promotional Downforce Cap. 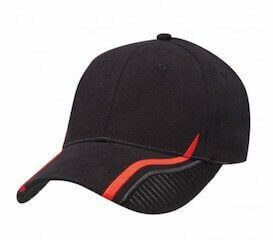 The promotional Downforce Cap is a great product that’s meant to be as functional as it is good looking. The custom Downforce Cap’s got what it takes to be a great cap, and so much more. It’s made from heavy brushed cotton fabric, a six-panel structured design, and a pre-curved peak for style. But good looks alone won’t make a good cap if it’s not comfortable to wear. That’s why we’ve put a padded cotton sweatband inside for sweat management, embroidered eyelets at the crown for air circulation, and a Velcro touch fastener for adjustability. But what makes the Downforce Cap stand out from other caps is its unique design on the peak. At the peak are two stripes on both the left and right side. The stripe is like a subtle lightning pattern and contrast in colour. At the outer side of each stripe is a mesh design by the peak’s edge. These design combinations give the decorated Downforce Cap a bold kind of attitude and eye-catching looks. 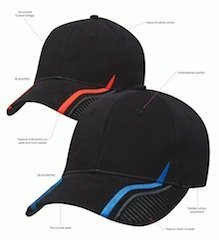 The branded Downforce Cap comes in two colours. Go with the cool icy look with Black/Royal, or go with the hot fiery look with Black/Red. Assign colours to competing teams and you’ll definitely have everyone’s game face on. So when you have your custom design ready, send it to us and we’ll have it printed or embroidered onto the customised Downforce Cap. 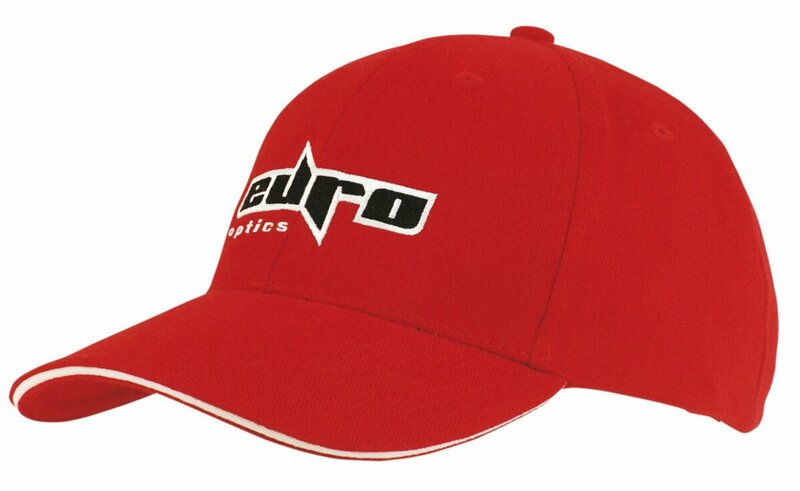 You’d be glad to know that you can have this great promotional cap even if you’re on a very modest budget. That’s right. We keep all our products priced reasonably so you’ll always be the big winner. Take on both fire and ice with our branded Downforce Cap. 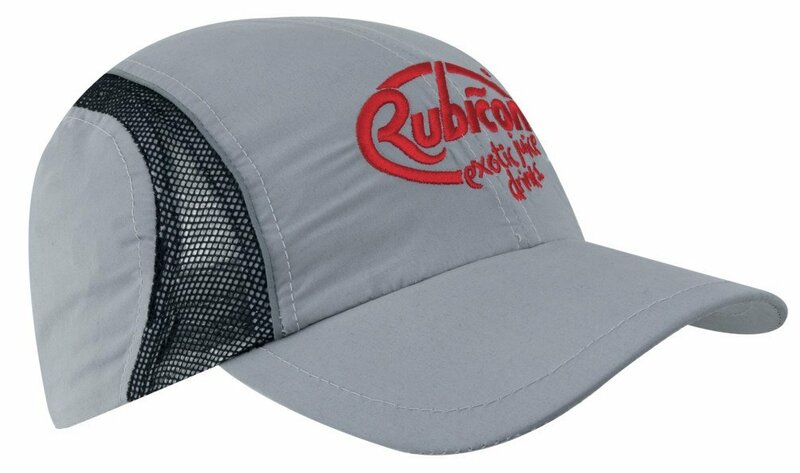 This sleek and comfortable hat will help your marketing make a memorable statement. Need something more mellow? Our Cappuccino Large Pralines and our other customizable confectioneries will surely fit the bill. 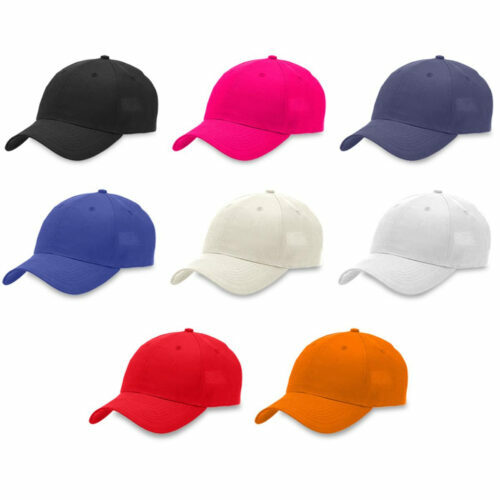 If you want to have a great promotion while saving the earth, do have a look at our personalised Eco Friendly Caps. Give us a buzz on our website if you want to do live chat, or call us at 1300 008 300.